Basecamp Adventures: EBC Trek Part 1 - "Restless till Lukla"
3rd Oct 08 the “D” day, we left the hotel early in the morning declaring “Everest here we come”…..en-route visited the Pashupatinath temple, with all the blessing the flight still did not take-off. No one can predict mountain weather, once you decide to go to EBC be prepared for all delays, plan-A, plan-B, plan-C is all we can propose and the mountain disposes at its will. If 5 hrs waiting at the airport was not enough for day 1, Keyur collapsed, I guess due to the suffocation at the airport, ended up with a deep cut just above the right eye. On final confirmation that the flight is not going to take-off we headed back to the hotel, took Keyur to the hospital. He had few stitches and few lab tests; all came out normal for our delight, we was fit and we were glad. Good long sleep, early breakfast and a hope that weather god will be on our side we once again reached the airport for the 2nd attempt to fly to Lukla. Murphy’s law, when some thing has to go wrong it will…applied again, the weather god was on our side but not the airlines. Feeling restless we spoke with the airlines only to get a response that people wait for more than 4-8 days to get on to a flight to Lukla and cancellations or delays are not unusual. We returned to the hotel with a heavy heart, but I guess this time we had to come up with a plan to ensure we make it to EBC. So we worked backwards, decided we still can try for both 5th & 6th, if we do not reach Lukla by 6th we will look for other trek routes. But all of us knew we only wanted to the EBC and nothing less. We got Narayan (our agent) to book the earliest flight and the chance of take-off is more, we ensured that the tickets we fully endorsed and that we will reach the airport by 6.30 am on 5th and try to board the 1st flight in case of any cancellations instead of the 3rd flight. 3rd attempt to fly to Lukla, we walked in as good as any localites at 6.15 am, saying hello to all familiar faces. The airlines staff greeted us as Lukla flight regulars, passenger who were with us for the last 2 days were delighted to see us back, and all of us waited with our toes and fingers crossed. We sat in the departure area reading a book, or scribbling notes or just playing cards, but were close to the announcement area not to miss any updates of flight # AG-305. Airport is a mess, its crowded, endless number of backpacks, parcels, stinking toilets, overly expensive snacks & beverages, flights never leave on time nor there is some thing called technology. Coming form a IT city it was appalling to see that a place which is a mini-world does not even have a computerized billing or boarding pass process. But that’s mountains, its one of the busiest airport, at one point I really admired the staff working there with very basic facilities and infrastructure. Nothing moves on time, we were re-assured the 3rd time in the last 3 days, not that it’s the inefficiency of the airlines or its staff, its just that mountains have their own mind and no soul can go against that. Even after 3 days of waiting I cannot say that we were angry or frustrated, we stared to acknowledge the fact that mountains rules this land. We did not run out of patience as much as we were running out of time and options as the last day for us to reach back Katmandu (KTM) was 17th Oct 08. “We are boarding”, the flight was announced we rushed to take the shuttle, reached the flight, the luggage was getting loaded the airline staff asked us the stay in the bus, we were finally leaving, just about to get down the shuttle, there came the announcement that Lukla airstrip is closed due to bad weather. We returned to the departure area, with our backpacks still on the aircraft, we hope that we may still make it, so the waiting continued; the only difference was that we almost boarded the flight. At 1.30 pm, the almost expected announcement came, the flight was officially cancelled, we were back at the hotel for the 3rd time. Everest is Everest and we were not willing to let it go so easy, we decided to pursue it till 7th Oct, if its still not happening then it was going to be Annapurna Basecamp. CNN weather reported predicted bad weather till 10th Oct, but we had hope, strength and the will to try and please the weather god. By now at Thamel we were know to every one, and ended up telling the story of cancelled flights. We also checked if we were in the right season, and to our little delight every one said that October is the BEST season for EBC. We had an additional plan, after sitting in the airport for 3 days we realized that the passengers of the cancelled flight do not get any priority, so we got Narayan to confirm the tickets for 6th and also book a flight for 7th early morning, this way we had a confirmed back-up flight for 7th. More shopping, more going around Thamel followed, and we hope to sleep well and wake up early to reach the airport by 5 am, we knew we could sacrifice a lot of comfort to get to Lukla. Day 4, as per the vehicle came to pick us up at 5 am, by the time all of us got up and were ready to leave it was 5.30 am. Keyur, Shabna & Ajit went to the hospital to get the dressing done for Keyur’s wound, I hoped they reach back on time. Maila, Sri, Subbu and me reached the airport. Weather was very clear, airport was full of life and so were the staff, I stood in front of the counter at 6.30 am, even though our actual flight was 9.00 am, requesting the staff to fly us out early, the staff were also feeling sorry for us. The lady in the counter counted some list and I knew we will fly early, in the next 10 minutes we were issued boarding pass for the early flight and we boarded AG-CHA in 15 minutes. We all knew that till the rubber hits the Lukla runway we are still in KTM!!!!. The flight was a small 18 seater, basic aircraft like the rest. 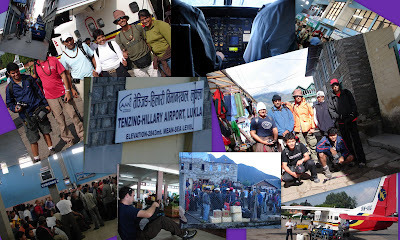 We were at the Tensing-Hillary Airport, Lukla in 24 minutes, and we were boldly delighted. Labels: EBC Trek Part 1 - "Restless till Lukla"